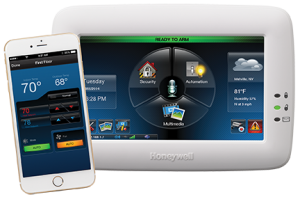 Modern day alarm systems have come a long way from when turning a key or entering a code was the total interaction between the user and the Alarm Panel. Even the key-fob remotes to arm and disarm the systems are becoming as archaic as cars than need a key to start. 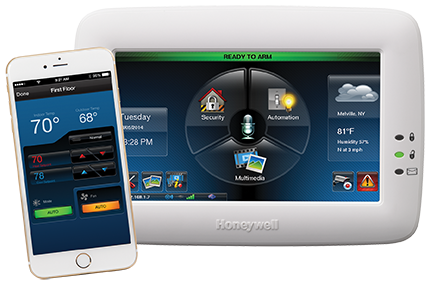 Smart phones, apps, Z Wave and touchscreen keypads have transformed the humble alarm system into a life changing experience. When you are leaving for the day, your lights can go off, the garage door can close and the thermostat can adjust itself to a more economical setting. You can also unlock the front door for the dog walker at the same time every week, have the lights turn up as the sun goes down and always enter a comfortable, well-lit home. See who is at your door from anywhere in the world. As long as your phone is within your reach, there is no reason for anyone to know that your home is empty. Let the caretaker into the house to take care of your aging parents. Know what time the cleaning company arrived. Tell the delivery guy to leave the package in the garage (open it for them, keep an eye on them with the cameras, and even make sure the garage is closed when they leave). Still prefer using a keypad, wireless, desk-top keypads are stylish, and can be placed on your office desk, or your nightstand. Honeywell Total Connect images © Honeywell International Inc.